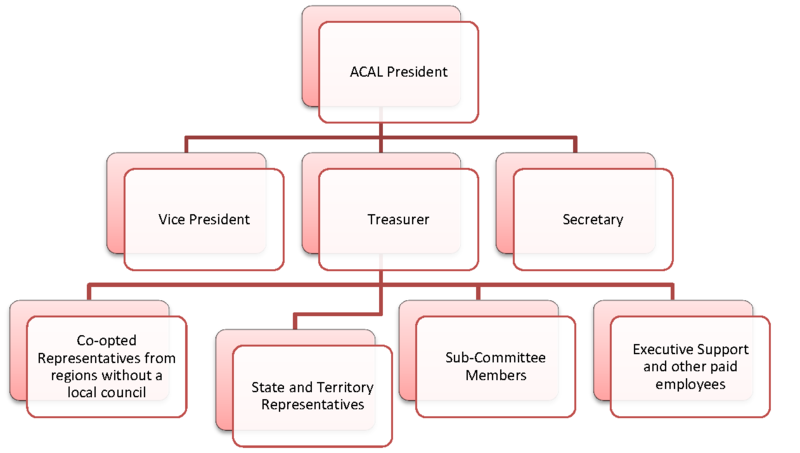 ACAL is managed by a volunteer committee and the position profiles are provided to assist members understand and undertake roles on ACAL committee. The four executive positions (President, Vice-President, Secretary and Treasurer) become vacant at each AGM and nominations are called to fill these positions by election at the AGM. State/Territory representatives are nominated to the ACAL committee by the local state or territory organisation. ACAL meetings are usually held by teleconference on a Wednesday 3:30pm – 5pm AEST approximately every six weeks. The ACAL Committee will review the time of meetings. Travel expenses will be met for specifically designated face to face meetings and for other meetings when representing ACAL on delegations. developing relevant strategic and business plans in order to achieve the goals of the Council. Overview of role: The role of the Vice President is to shadow the President in providing leadership and taking responsibility for the organisation and the Committee and to step into the President’s role where needed. Overview of role: The role of the Treasurer is to be responsible for the financial supervision of the Council to allow the Committee to provide good governance. The Treasurer is responsible to manage the Council’s finances and regularly report on its financial status to both the ACAL Executive, Committee and the Council members. supporting any required auditing processes to be submitted to the Annual General Meeting. Overview of role: The role of the representative of each of the States and Territories is to be a voice to represent and gather local viewpoints and to disseminate national ACAL views, ideas or papers.